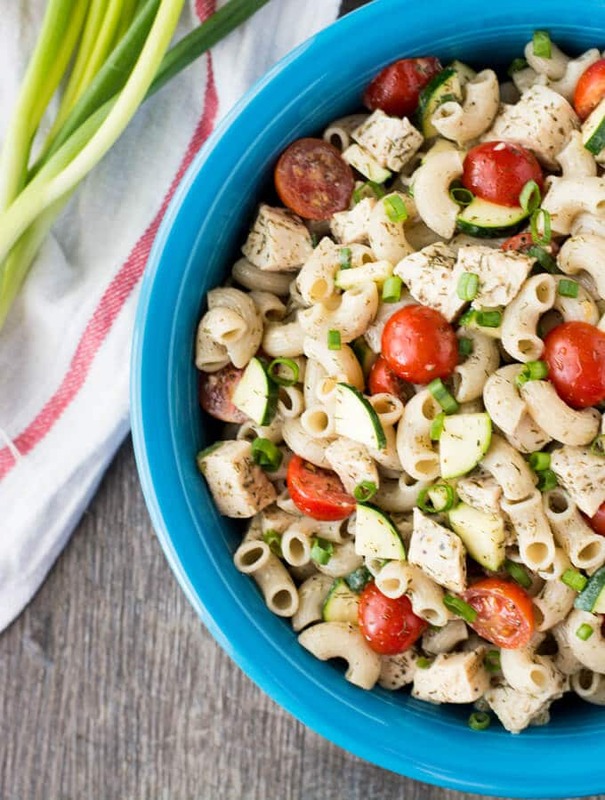 Featuring a light creamy dressing this Chicken Macaroni Salad is full of protein and veggies! Super easy to make, healthy and delicious! Summers are definitely hot here in Texas, and this year is no exception. Multiple 100-degree weather days has me craving dishes that don’t require me standing over a hot stove forever. 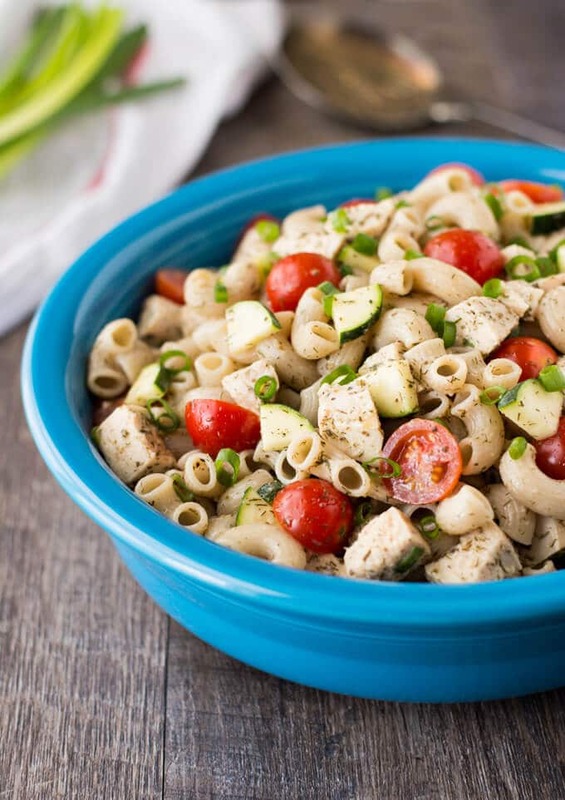 This refreshingly light Chicken Macaroni Salad is the perfect Summer salad recipe! If you are short on time, you can use some store-bought, pre-cooked chicken breast. I occasionally buy the cooked chicken breast from the deli section at Trader Joe’s. They are surprisingly really tender, not dry and taste good. The All Natural one has a clean ingredient list. Cook the pasta in boiling, salted water until al dente. Then drain and rinse under cold water. While the pasta cooks, you can prepare the dressing in the bottom of a large bowl. The dressing starts with some olive oil, red wine vinegar, Dijon mustard and whole milk yogurt that results in a light creamy dressing. Fresh veggies are added to the mix and help create a filling and healthy salad full of flavor! This will serve 4 to 5 people, depending on how hungry you are. This will transport well, making it a great work lunch idea. Featuring a light and creamy dressing, this Chicken Macaroni Salad makes for one tasty lunch dish. Transports well, so it's also great for work or school lunches. Bring 4 quarts of water to boil in a large pot. Add salt, then pasta and cook, according to package directions, until tender. Drain and rinse under cold water. While the pasta cooks, make the dressing. In the bottom of a large bowl, whisk together the olive oil, vinegar, yogurt, dried dill, garlic powder, salt, celery seed and scallions. Let that sit while the pasta is cooking to give the flavors time to marry. Add the pasta, chicken, tomatoes and zucchini to the bowl and gently toss to combine. Check seasoning and add salt if needed. Serve immediately or refrigerate for a few hours, then serve. Yes! What a beautiful dish! Love the sound of the ‘dressing’. Those baby tomatoes are simply beautiful! 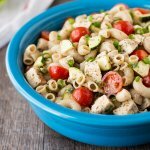 LOVE the idea of a light dressing on macaroni salad! The dried dill in this sounds wonderful, too! What a perfect summer salad! I love that you went with a light dressing! This looks just perfect for a cookout or a quick lunch to make in advance and keep on hand! This sounds so good! Might have to make some tonight. Love all of these summer flavors! This would be a hit with my family. I love that it’s full of veggies and protein. Yum!